Texas A&M quarterback Johnny Manziel, Notre Dame linebacker Manti Te'o and Kansas State quarterback Collin Klein are the finalists for the Heisman Trophy. Manziel is the favorite to win college football's most famous award when it is presented Saturday night in New York. He would be the first freshman to win the Heisman and the first Texas A&M player since halfback John David Crow won the school's only Heisman in 1957. Te'o is trying to become the first defense-only player to win a Heisman and the eighth player from Notre Dame. The Fighting Irish have had seven Heisman winners, tied for the most, but none since Tim Brown in 1987. Klein would be the first player from Kansas State to win the Heisman. Here's a look at how the three finalists stack up. For Kansas State, there was a clear path to the BCS championship game and a likely Heisman Trophy for Collin Klein. That all changed after an unexpected November blitz by Baylor. A week after taking over the top spot in the BCS rankings, and getting so close to a chance to play for their first national championship, Klein threw three interceptions and the Wildcats were throttled 52-24 at Baylor. Still Klein is a finalist for the award based on his impressive numbers throughout the season and he padded his credentials in the Big 12 title game: Klein threw a touchdown pass and ran for two scores and No. 7 Kansas State beat No. 23 Texas 42-24 on Saturday night for its third conference title in 117 years and a trip to the Fiesta Bowl. Amazingly, Klein was largely overlooked coming out of high school in Loveland, Colo. His only other interest came from the likes of Colorado State and Utah. Just how highly sought were his quarterback skills? Even the coaches at Kansas State turned him into a wide receiver when he first got on campus. Now they have a Heisman finalist at quarterback. Johnny Manziel, better known around Texas as Johnny Football, crashed the Heisman party after he led the Aggies to an upset win over then No.1-ranked Alabama. Now his chances to become the first freshman to win the award have improved even more after accounting for five more touchdowns in the Aggies' rout of Missouri. Manziel won the starting job near the end of training camp and went on to account for 4,600 yards of total offense. He has thrown for 24 touchdowns and ran for 19 this season to make him the favorite to win the Heisman Trophy. Before dominating Missouri, Manziel had already broken the NCAA freshman quarterback rushing record of 1,029 yards set by Missouri's Brad Smith in 2002, and the freshman record for total offense of 3,827 yards set in 2000 by Jared Lorenzen on A&M. He is the fifth player and first freshman in FBS history to pass for at least 3,000 yards with at least 1,000 yards rushing in a season. CBSSports.com's Gregg Dowel says Manziel should win the Heisman despite his freshman status. "Johnny Manziel is the best player in college football this season, a large statement to make about any freshman, any year, but an enormous one to make about a freshman this season -- when there are so many viable candidates," Doyel writes. 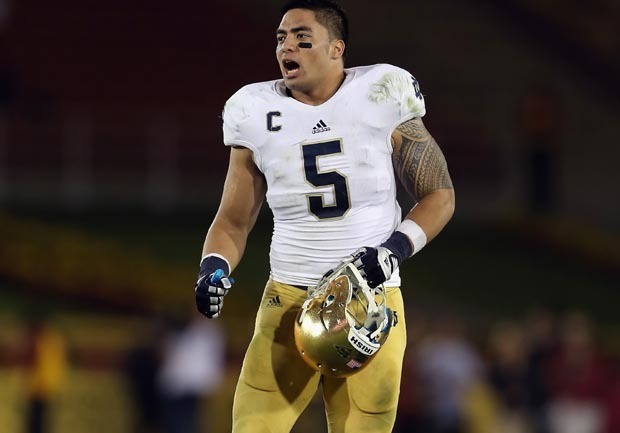 Notre Dame linebacker Manti Te'o says if he wins the Heisman Trophy it would be a victory for all defensive players. "It would definitely be a great step for all of us," he said. Te'o would become just the second defensive player to capture the award, joining Michigan's cornerback Charles Woodson, who won in 1997. While being a defensive player makes winning the award a challenge, Te'o is the face of a defense that for much of the season carried the top-ranked Fighting Irish (12-0) and has Notre Dame on the brink of its first national championship since 1988. He finished the regular season with 103 tackles and seven interceptions  a school record for a linebacker. But Te'o, who appeared on the cover of Sports Illustrated earlier this year, said that the prestigious award is not his goal. "I'd rather be holding a crystal ball than a bronze statue," he said.